The weather in New Orleans could best be described as fickle, or maybe mercurial would be a better word. In a city that cherishes tradition, the weather might be the only thing that changes with frequency. From the sopping rains and damp chilly days of winter to the steam bath summer days and sultry nights — with sudden bursts of elephant tear raindrops even when the sun is shining — the weather is as unpredictable as the river that cups this “beautiful crescent” in her hand. My friend and tailgate partner Justin told me once that “you get about ten perfect days a year in South Louisiana,” and from what I’ve seen, he’s right. Fortunately, yesterday was one of those days. It was glorious. The kind of day that you would take every day forever. It was also, as luck would have it, the day of the Irish Channel Saint Patrick’s Day Parade and my first time riding on a float. I was riding for Finn McCool’s Pub, a venerable institution located at 10 o’ clock and 120 feet from front door (I drunkenly paced it off last night, as well as recorded my time in the 30 yard dash) that has become my unofficial home/office. Run by the brilliant Stephen and Pauline Patterson, Finn’s is where you’ll find me for Saints games, Yankees games, or just plain ole fun and games. It’s the kind of local you dream about, and if I ever leave Mid-City it will be the place I’ll miss the most. 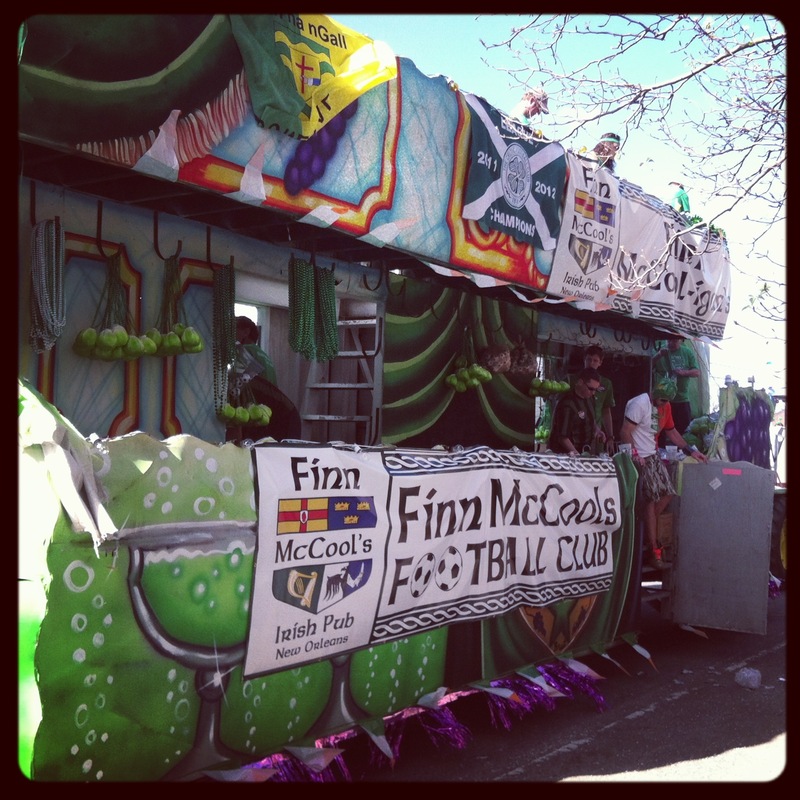 After a stiff Irish coffee of my own creation, I ambled across the street into a hotbed of activity as the bus we rented to take us to the float was already being loaded with bags of beads, coolers of beer, and eager float riders. We were to leave at 9:30 a.m. sharp to get to the float, which allowed me enough time for a quick Abita Amber. The parade started at 1:00 p.m., and I wasn’t the only novice float rider. In fact, Finn’s had never rolled before, so I was part of the inaugural mission, and since no one wanted to be late, we got there early. Very early. About three hours before the parade early, and there was no way we brought enough beer. Our bus lolled slowly through Mid-City, up to South Carrolton, and then onto the Expressway, New Orleans unfolding before us. I’m rarely a passenger these days, so the opportunity just to look at my city — our city — was as pleasurable as the Irish ballads and dirges being sung from the back of the bus. Even Joel, the hot tempered Alabama fan and my seat mate, was a cheery curmudgeon this morning. He was also one of the few people I knew outside of the Patterson’s, as the regulars rolling out this morning were mostly part of the Finn McCool’s Soccer Club. Anyone that knows me knows that I am not what you would call a huge enthusiast of “the beautiful game.” Now don’t get me wrong, I am not a hater either. It’s just not something, outside of World Cup, that I’m a devotee of. I don’t know any of the players, the players change teams too often, I don’t have any allegiances or hatreds other than to hate Man U because that seems to be the proper thing to do (much like hating the Yankees in soccer parlance), and I don’t understand the leagues. If I had to pick a team, I’d probably just choose the Celtic because I look good in green and it is the Irish thing to do. Regardless, I’ve been told that if I purchase a Celtic jersey I can come to the games early on Saturday mornings and drink beer and cheer when everyone else cheers and curse and moan when everyone else curses and moans. This seems like an agreeable arrangement to me, kind of like church almost, but with beer and comely bartenders. Not knowing anybody used to give me the fantods, but now I’m at ease around strangers. And as luck would have it, I wasn’t in the company of strangers, but friends. First I met John, a fellow New Jerseyan, who was from the next town over. I’m still not convinced that he wasn’t an old childhood friend that moved away. Next I met a lad from Ireland that shared my surname, curiously, and also lived in NJ — the same town no less — and knew all of my Irish friends and bartenders. All of the sudden the jokes were flowing and the conversation rolling and I knew everyone. As we loaded into the float to hang our throws and check out our “home” for the next six or so hours, there was an air of conviviality that lowers your blood pressure and makes not smiling impossible. The float itself was a rickety old thing; if you wanted to set a booby trap to maim or kill you could hardly do better than this rented rolling death machine. The plywood floors had spots as soft as a newborn’s head, the stairs were uneven, and the ladder leading to the upper deck was pitched almost backwards with unevenly spaced rungs. There were cups screwed into the wooden frame in front of each rider to facilitate alcohol consumption and to deaden the senses to the danger around you. Large metal hooks to hang throws from, similar to the kind they hang cattle carcasses from, hung behind and overhead, plated with tetanus inducing rust. And the rail was placed as just the right height to insure that a 6’1″ person like myself would be pitched overboard in the event of a sudden stop. All in all a sound craft indeed. I set up my “station” similarly to how I would a restaurant kitchen: to limit inefficient movement and maximize speed of service. I had a lot of beads to throw and a short time to throw them. I also placed my coveted “cabbage beads” behind me. These Chinese made (and most likely lead filled) plastic cabbages would only be given out to the luckiest of parade attendees. It took us all of about twenty minutes to do everything we needed to do float related. Maybe less. Which left us with three hours to kill before we started rolling: just enough time to walk up to Magazine Street to Aiden Gill’s for some gumbo and Smithwick’s, and to be greeted by Mr. Gill himself. I can’t say I would pay forty dollars for a haircut. I usually go to Super Cuts because in certain regards I am incredibly cheap and haircuts are one of those regards. But, if I were to pay forty dollars for a haircut and a shave, I would go to Mr. Aiden Gill because of his dry, quick wit and his hospitality. In fact, I think I owe it to him at least once for the gumbo, the beer, and being able to stand in his sun soaked courtyard. I will consider the forty dollars money well spent and a contribution to next year’s gumbo and beer. After meandering around Magazine Street and taking in the sights — mostly scantily clad young women in excruciatingly short shorts, low cut tops, and green wigs who give you ideas you never knew you had — we made our way back to the float. By this time the beer had set in and I made the wise decision to hydrate with a few bottles of water before doing any further damage. As we climbed unsteadily onto the float, one by one, like a half-assed Noah’s Ark, I could only think that the day would be either exalting or disastrous: it had all the potential for either. One thing I’ve learned is that you wait around a lot when you ride; and being the last float in the parade, you wait around more than most. We were set to roll at 1 p.m, but in actuality we probably didn’t move until about 1:45 p.m., and even then in was only in short spurts. I held my first throw for about ten minutes without having a target until I just decided to throw it into a tree… I needed to release some nervous energy. And then all at once we started to move steadily, and the crowds that started as a trickle of a few outstretched hands began to coalesce into a river of people, hands waving, a fingers moving like reeds, voices rising up and calling “Cabbage!” “Cups!” “Throw me something.” And it starts happening really fast. All of the sudden you can’t keep up. It’s like tickets falling out of the printer in a busy kitchen as you fight to recover your composure. You want to throw something to everyone. But you can’t. You can only hope the person standing next to you managed to hit the person you missed. It’s funny what you can see from the float… how much you can see. Yet, at the same time, it’s hard to see as well. You just try to make eye contact, or point. I was also amazed at the amount of people who would call for something and then avert their eyes as it was launched their way. Keep your heads up people. Mostly, I tried to throw to the kids, and the people that wanted it the most. There are few feelings worse than throwing to a little brother but missing his little sister, or vice versa, and there were definitely tears mixed in with smiles along the route. There were also some interesting propositions, as one girl basically offered to show me everything but her self-esteem for a plastic cabbage (incidentally she was denied — I gave it to a kid). There were also some scary moments, particularly as a large man passed out in what seemed like slow motion right before me, falling through the barricade, the beads I had just thrown hitting him right in the face as he collapsed into the street. I hope that man is alright. It felt like a movie seeing it happen and I was terrified for him. The camaraderie you develop while riding is pretty amazing. I’ll liken it to a less intense version of military service. But it is equally real, as we all sacrificed for each other, sharing throws, grabbing beers, and one true hero even jumping off the float to make a mid-parade beer run. All of this amid laughs, jokes, mock insults, and trying to use a mobile pisser while holding a beer in one hand and yourself in the other; it requires great sea legs and a heightened sense of hygiene. As slowly as the parade begins, it seems to end equally as fast. I honestly couldn’t believe how quickly the time passed. Before I knew it we were back on the bus. I didn’t even get to finish my cigar. And we we’re already talking about doing it all again next year: how to make it better. But I honestly don’t know if it could have been any better. Because it was perfect. It was New Orleans. Sounds like a fun way to spend a day (barring any float-related disasters). Plus I learned a new word… fantods. Thanks for sharing.